Myanmar (Burma) Army Honour Guard. Photo by Peerapat Wimolrungkarat, Thai Government photographer, Wikipedia Commons. When Suu Kyi took over after a sweeping victory in the elections, she had three priorities in mind. The first was ethnic reconciliation, the second was constitutional amendment and the third economic empowerment. Within the limited space available to her under the 2008 constitution, Suu Kyi has deftly managed to make some progress in ethnic reconciliation. On the economic front, Myanmar continues to suffer from “economic underdevelopment” as Suu Kyi herself admits and is because of lack of peace and stability that depends very much on the Army. As for the second, the country has a long way to go as the Army still holds the key and is unlikely to relent in the near term. Amidst all these, Myanmar has shot into prominence internationally for the wrong reasons- the Rohingyan crisis that resulted in a firm response from the army to simultaneous attacks on 30 Police posts in northern Rakhine Province by a terrorist unit that called itself as the Arakan Rohingyan Salvation Army. Consequent to the second round of the 21st century Panglong Conference in end May 2017 there has been a lull in the political activity in Myanmar except for renewed efforts between the ethnic groups and the government for sorting out the differences and encouraging more groups to sign the National Cease-fire Agreement in the near future. The latest good news was that the UNFC- a group that did not participate in the Second Panglong Conference is said to have decided to go the “National Cease Fire Agreement Way” as proposed in the first conference. 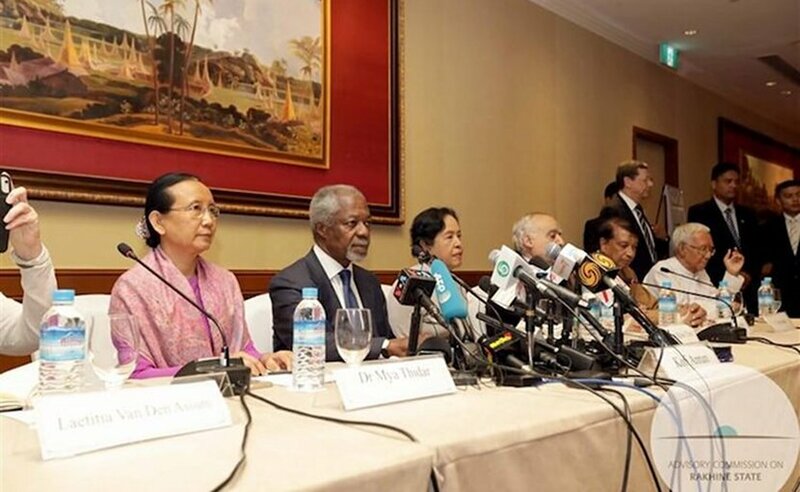 Kofi Annan (second from left) and Aung San Suu Kyi (right of Annan) introducing the report of the Advisory Commission on Rakhine State, Burma (Myanmar). The nine- member Arakan Advisory Commission under the Chairmanship of former UN Secretary General Kofi Annan was constituted in September 2016 to investigate and give their recommendations for the conflict involving the Rohingyas and the other communities in the state of Rakhine. The commission submitted its final report on 23 August 2017. 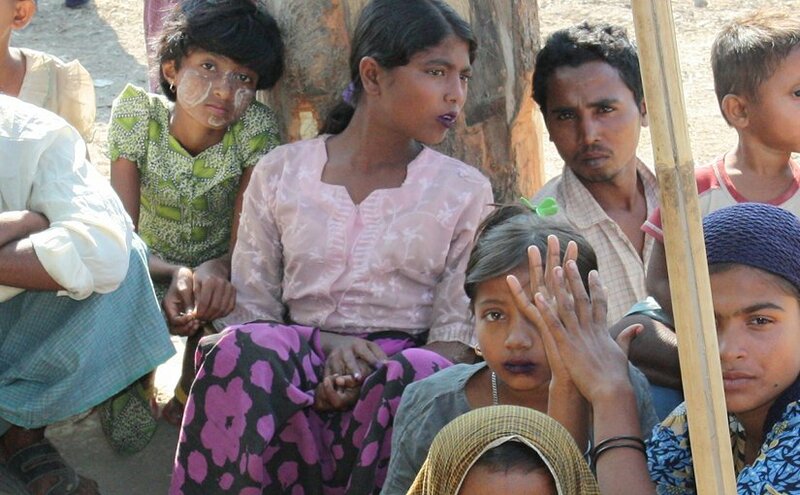 While indicating that a highly militarized response is unlikely to bring peace to the area, the commission recommended among other things the review of the 1982 citizenship act for granting citizenship to the Rohingyas and for their freedom of movement, employment opportunities and socio-economic development of the area. The State Counsellor’s office conveyed its appreciation of the final report and that it is serious in its efforts to find a way forward for Rakhine and indicated the progress already made in this direction on the basis of the recommendations made in the interim report. However, it had also enumerated the constraints being faced by the government in this regard. In the early hours of 25 August 2017 the Rohingya militants staged a co-ordinated attack on 30 police posts and an army post in Maungdaw. The Army Chief Senior General Min Aung Hlaing “cited the casualties of security forces as 13 (11 policemen and two soldiers) besides an immigration officer, a member of health staff and 14 ethnic Arakanese civilians. He also described infrastructure that had been destroyed including eight bridges and more than 2700 homes”. – The Irrawaddy 04 September 2017. The Arakan Salvation Army (ARSA) which has claimed responsibility for this attack has been declared a terrorist organisation by the Government. The Maungdaw area has been declared a military “operational area” in order to ensure the “effectiveness” of the clearance operations as indicated by the Myanmar Army C.in.C. In the crackdown and the clearance operations launched on 25 August and which is still in progress, the causalities and the number of Rohingyas fleeing into Bangladesh have been increasing every day. A Reuters report of 05 September 2017 indicates that nearly 1,25,000 Rohingya Muslims have fled to Bangladesh and at least 400 of them have been killed besides burning of homes and extensive damage to infrastructure. Aung San Suu Kyi and her government is under great pressure for an immediate end to the military operations in this area and to provide humanitarian assistance and development aid for the short and long term. The UN Security Council met on 30 August 2017 and expressed its concern. Bangladesh, Malaysia and Indonesia have expressed their concerns on the increasing violence against Rohingya Muslims. Early August 2017 the Yangon Region Chief Minister had commented “The Military should be under civil administrative rule. According to protocol the Commander-in-Chief of the Armed Forces is at the level of the director-general. But we have to deal with the (C-in-C) as head of state. This is not democracy at all” – Frontier August 06, 2017. The Armed forces created a ruckus over this remark and the Yangon Region Chief Minister had to tender an apology for his remarks. The Tatmadaw went to the extent of saying that such remarks damage the prospects for national reconciliation and for building a long term relationship between the government and the Tatmadaw. There was another instance- the Economic Advisor to the NLD besides blaming inept bureaucracy, pointed out that military control as one of the reasons for poor economic performance. He said that the first challenge to improve the stagnant economy, is the constitution and its limitations with the Army taking away 25 percent of the parliament seats and three ministries! It looks that, given the constraints and the limited space available, the present government is trying to maintain a harmonious relationship with the Tatmadaw (Army). However, the obstacles posed by the Tatmadaw in the peace process, its offensives on some major ethnic groups and the current operations against the Rohingyas indicate that the relations are at present strained and the government is in a weak and delicate situation to handle the Tatmadaw. For instance the unilateral decision of the Army to undertake “clearance operations” in Kachin controlled area would certainly go against the spirit of the recently held Second Panglong Conference. When members in the Parliament raised objections, the Army representative bluntly told them that according to the Constitution the army need not seek approval from anyone! China and Burma signed five agreements on that day regarding co-operation in economic development, health and the preservation of historic monuments in Bagan. Of these agreements the framework of the Silk Road Economic Belt and the 21st Century Maritime Silk Road Initiative and the establishment of the China- Border Economic Cooperation Zone are very important. China has taken special interest in the ongoing peace process in Myanmar by sending its special envoy Sun Guoxiang who had met Aung San Suu Kyi and some ethnic groups and had even arranged a flight to fly some ethnic groups to Naypyidaw to attend the peace conference in end May 2017. China sent Song Tao, Head of International Liaison Department of the Communist Party of China on an official trip to Myanmar. He had a meeting with Aung San Suu Kyi on August 04, 2017 which was highly publicised. There are indications of a high level visit from China to Myanmar. China is the only neighbouring country which had not commented on the current Rohingya Crisis. With the UNFC deciding to go by the NCA, the field is now open between the China controlled Federal Political Negotiation Consultative Committee (FPNCC) and the Government. This group completely negates the modalities laid down by the National Cease fire and would take on the government collectively. While Suu Kyi’s government is willing to be flexible, the Army appears to be reluctant to move away from the NCA! It is not willing either to recognize the northern alliance as yet though it is now part of the FPNCC. Here again the Army holds the key. Prime Minister Narendra Modi was on his first bi-lateral state visit to Myanmar from 05-07 September 2017. He had last visited Myanmar in November 2014 for ASEAN-India Summit. India, though not trying to compete with China, is improving its connectivity with Myanmar and is actively involved with Myanmar in some development cooperation projects in its pursuance of its Act East policy. The PM’s visit appears to have been a great success. It had indicated, that unlike other countries, it is not interested in commercial cooperation and has no agenda of its own in Myanmar. State Counsellor Suu Kyi has too many challenges to cope with. People who have swept her into power have high expectations and may not be aware of the constraints placed on her in the 2008 Constitution to Myanmar’s transition to democracy. Despite obstacles in the peace process and in maintaining law and order she has done her best, given the fact that she is not in control. She still has the international support. Where she has power she has used – for e.g. she has not allowed the National Defense and Security Council to meet where the army has the majority. She did not allow martial law to be declared in Northern Rakhine State, though tough clearance operations are still going on. The Rohingya problem which has shot into lime light needs to be attended to immediately. She could do more in improving the economy and this cannot wait for the ethnic problem to be solved.